You will normally be invited to a location within the area of your GP’s surgery. If your invitation is not at a convenient location then please let us know and we can arrange an appointment to any convenient location where we are currently screening. Just complete the change your appointment form and we will rearrange it for you. Our appointments are at five minute intervals. 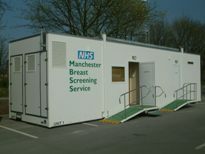 If you have been invited to a mobile unit and feel that you may require a longer appointment please contact the Screening Office. Please note screening is strictly by appointment only.